Entries cover representations of Jesus in the Bible and the writings of key theologians, examining the essentials of philosophical and religious views across history. The set also includes hundreds of entries that reflect on the role Jesus has played in popular culture and contemporary vernacular religion-perspectives that are not usually placed alongside theology. 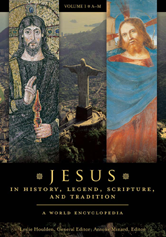 Through the encyclopedia, students will see how artists, writers, philosophers, church figures, and others have imagined Jesus and been influenced by their perceptions of him. At the same time, primary documents will encourage students to compare and contrast ideas and evaluate arguments that have arisen over 20 centuries.